Note: we’re home! I typically write these posts a day or two (or three) after the fact, and while I wrote most of this one on the train home, I wasn’t able to publish it until today, Monday the 20th. I still have one or two posts still to go, but I wanted to alleviate any potential confusion about where we were. 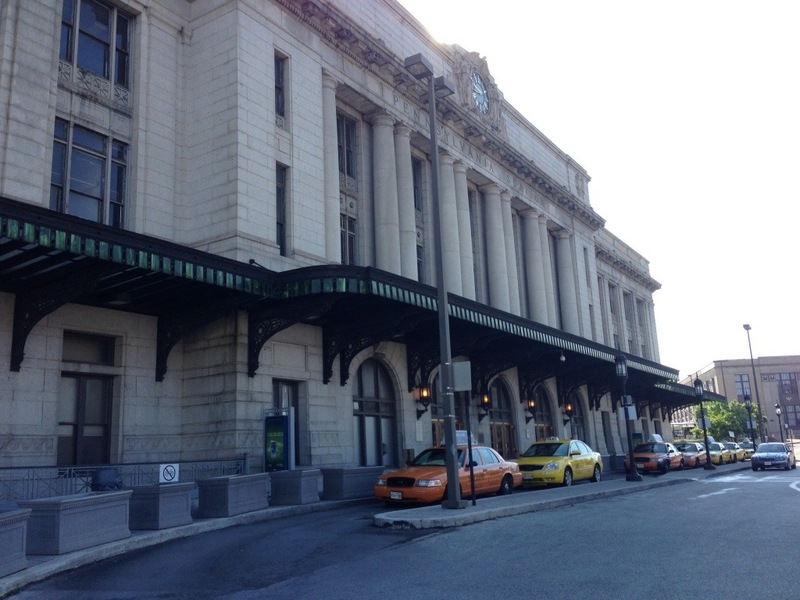 Baltimore’s classic Penn Station, built in 1911, is the eighth-busiest station in the Amtrak system. Our train was scheduled to leave Baltimore at 9:30am, so we had pre-arranged to have a taxi waiting at our hotel at 8:00 that morning. Having packed everything the night before, checkout was swift and simple. Penn Station was only two miles from our hotel, and it being a Sunday morning there was no traffic. Penn Station looks much as if it must have looked back in 1911 when it first opened. It is a large, imposing stone structure with grand white columns and a large clock centered above the main entrance. From the outside, the only incongruous element is the huge brushed-aluminum “Man/Woman” statue directly in front of the station. 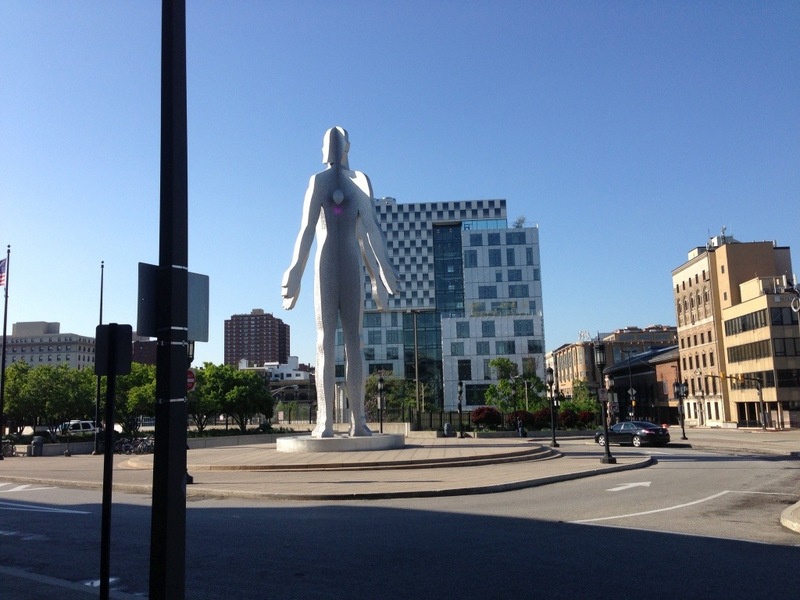 This giant piece of modern art has apparently caused quite a controversy in the Baltimore community, and I can see why. Although it is an interesting piece of modern art, I do agree that placing it right in front of such a classic old building makes little sense. Inside, the station is every bit as beautiful as the outside, if not more so. 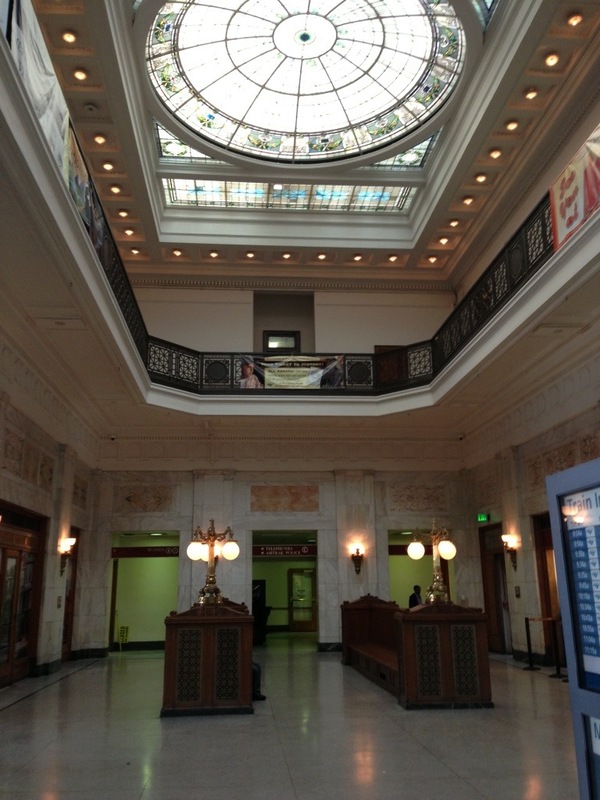 The impressive stained-glass skylight illuminates the marble floors and the marble-and-Rookwood-pottery-tile walls. Penn Station is a very busy place, serving not only Amtrak but also a separate commuter rail system and a local light rail system. Given that, you would expect that we’d have had some good options for breakfast. But our choices were a Dunkin Donuts franchise or a bar that served pre-made breakfast sandwiches kept warm under a heat lamp. We opted for the latter, along with some bananas and juice (for me) and coffee (for Nancy). If our train had been scheduled to leave Baltimore at an earlier time we instead would have simply eaten in the dining car, but by 9:30 that option was no longer open to us. We were once again on the Cardinal, but at least when it reached Baltimore it was on time (it had originated in New York about three hours earlier). We boarded and once again settled into our roomette. I’ve described the diminutive train and its route in an earlier blog entry, so I won’t repeat that here. This time, although the river we followed through a good part of West Virginia was still running high, the communications towers were functioning and so they did nothing to delay our train. Not that we weren’t delayed, however. At some point along the way in a thickly wooded section of West Virginia our train had to stop because a tree had fallen across the tracks. The conductor and the train crew spent some time trying to shift the tree, but to no avail. Then, the engineer decided that he could simply run right over the tree. Nancy and I never did get a good look at the tree, so I can’t tell you what kind it was or how large the trunk was, but apparently the engine was heavy enough that it could crush the tree without derailing any part of the train. So we proceeded cautiously forward. And then we stopped. From what we later heard, a branch from the tree we ran over had reached up and disconnected a hose or cable either beneath one of the cars or between two cars. Whichever it was, the problem was shortly fixed, and we were soon on our way once more. Altogether we probably lost about forty five minutes to the tree, which wasn’t too bad. But, of course, a train that is off schedule is one that can interfere with freight traffic, and indeed we lost additional time over the course of the trip causing us to arrive in Chicago two hours late. On our previous journey on the Cardinal our delay had forced us to make some quick adjustments to our travel plans. Not this time, however. The Cardinal was scheduled to arrive in Chicago at 10:00am, and our next train left at 2:00pm. Even with a two hour delay we would have been just fine, but we’ve learned to never assume that such a connection will be successful. Accordingly, we had booked our next train for the following day, and I had reserved a room at the JW Marriott, which is an easy three block walk from Chicago’s Union Station. On the day of our arrival into Chicago we had elected to forego breakfast on the train, knowing that we would have our pick of Chicago restaurants for lunch when we arrived. After checking into our hotel and dumping our bags, we made a beeline for Giordano’s Pizza. Giordano’s is known for their stuffed pizza, but that seemed a bit much for us so we split a small thin crust pizza and a salad. Suitably fortified, we planned out our next move. 24 hours in Chicago with no plans or obligations! We had made a late dinner reservation, so that was taken care of. We decided to explore Millennium Park, a 24 acre section of Grant Park near the Lake Michigan shoreline. We also decided to take a boat tour, either on the Chicago River or on the lake itself depending on when the tour left and what we would see. As is our habit, we elected to walk the two miles or so from the hotel to the park. 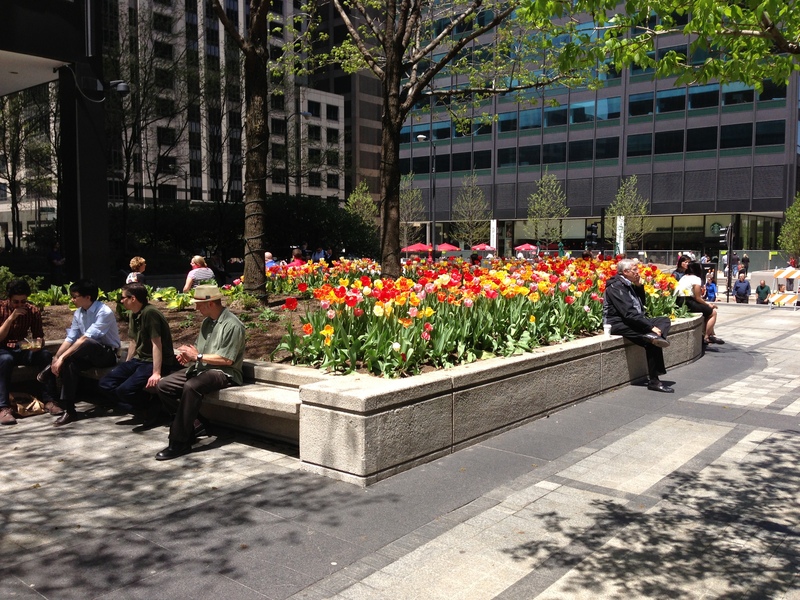 I have to hand it to Chicago: for a big city, they sure know how to use plants to dress the place up. All throughout the city we saw beds tucked in here and there that were just bursting with tulips and other flowers. Everywhere we went the trees were in blossom. At the park, the flowers and trees were truly amazing: huge beds crammed full of brightly colored tulips, roses; you name it. We loved the park; it seemed ideal for a place like Chicago. It had large gardens for those wanting to get back to nature, a large open-air theater for the more entertainment-minded, and large modern sculptures for those wanting to explore their artistic side. 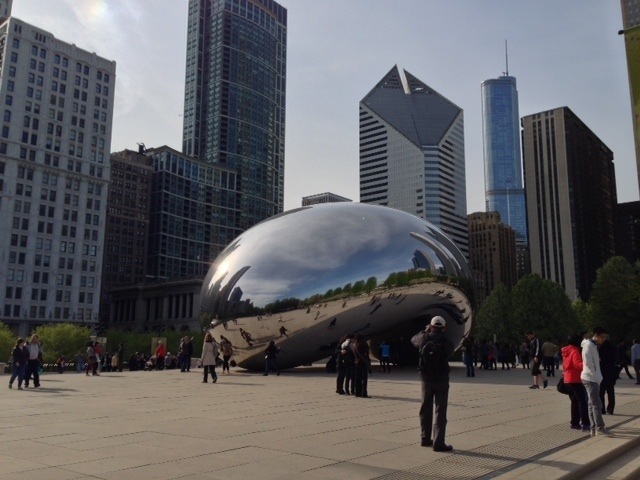 In the latter category was “The Bean,” a huge polished chrome bean-shaped sculpture that you could walk under and around, watching how your reflection changed as you moved. By the way, Chicagoans might know how to brighten up their city with a little greenery, but they certainly don’t know how to use a crosswalk. Or maybe they’re just ahead of the rest of the country. In Chicago, pedestrians cross at the corners, but they don’t pay any attention to either the crosswalk indicators or the traffic signals. They just look both ways (or only one way, if, as is often the case, they are crossing a one-way street), and if it appears that they can get across without getting killed, they just cross, even if the light is against them. We felt a bit foolish standing on street corners waiting for the “walk” sign to come on while everyone else was actively crossing the street; eventually we gave up and joined the crowd. 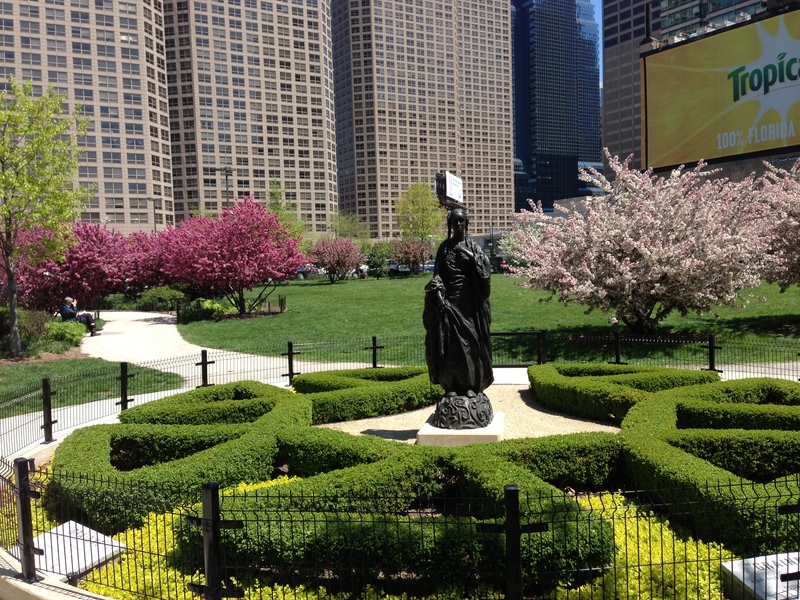 After wandering the park, we headed over to Navy Pier, from where, among other things, many of the boat tours leave. We elected to take a thirty minute lake tour, which ran along the breakwater and gave us nice views of the Chicago skyline. That was enough for us, so we walked back to our hotel via the “Miracle Mile.” The Miracle Mile (Michigan Avenue) is (was?) Chicago’s premier shopping district, although we saw little in the way of high-end retail on our walk. Either things have changed quite a bit, or we went the wrong way. But we weren’t in the shopping mood anyway. We just enjoyed seeing the city and stretching our legs. Dinner that night was at RPM. This is an Italian restaurant that was suggested to us by our goddaughter; the restaurant is apparently owned by someone involved with a reality TV show, and she is a big fan. The restaurant was quite crowded, and we were lucky to have gotten a reservation at all. We walked there from our hotel and arrived about half an hour early. We figured we’d just wait in the bar, but when we saw how packed the bar and the lobby were, we let the host know that we’d be back at our appointed time, and we promptly found another nearby restaurant with a bar in which we could sit and have a drink. By the time we made it back to RPM the bar was a bit quieter, but the restaurant was still completely full. We were promptly seated at a centrally located table from which we could do some people-watching. We were both struck by the age of the patrons: we were practically the oldest people in the restaurant. The demographic was clearly thirty-somethings. The decor–modern, hard-edged metal, wood, and glass–and the music all seemed perfectly targeted to that age group. Even though we are slightly out of the target age range, we never felt uncomfortable. And when the food came, we forgot all about the other patrons: the food was absolutely fantastic. We shared a Shredded Brussels Sprouts salad, which was truly eye-opening, and one of their Pizzettes (a small pizza); it, too, was great. For my entree, I had the Carbonara, and I can honestly say I have never had better. Nancy had the Ricotta Ravioli, which she just loved. We had thought we might take a taxi back to our hotel, but it was a nice night so we decided to try walking, and if things got uncomfortable (safety-wise) we’d flag down a cab. As it turns out, we felt safe the whole way back and so we ended up walking off our meal and enjoying the cool night air. Our hotel was quiet when we returned, and we went straight to bed and got a really good night’s sleep. The next day we collected all of the books we had purchased so far, along with some other souvenirs, and hauled them to a nearby FedEx office for shipping home. Altogether they were quite heavy, not to mention a bit bulky, given the way we were traveling–walking a lot with our bags, and hauling them on and off trains–it was well worth the shipping cost to not have to carry them with us for the remainder of our trip. Once we had sent the books on their way, we returned to our hotel, packed up, and checked out. We then walked the three blocks back to Union Station and once again deposited our bags with the luggage room attendant. That freed us up to once again wander the immediate neighborhood, to find something to eat, and to pick up some more provisions for that evening’s “piazza” time on board the train. Because it was nearby, we made our way down to Old St. Patrick’s Catholic Church. It is one of the few buildings to survive the Great Chicago Fire of 1871; they claim it is the oldest public building still standing in the city of Chicago. There had just been a wedding, but we went inside and spent a few moments sitting in one of the pews, admiring the stained-glass windows and the clean, simple design of the church’s interior. Back at the station, we sat in the first-class lounge, waiting to be led to our train, the California Zephyr. As we were settling into our chosen couch, a woman with a British accent asked if the adjacent couch was occupied. I indicated that it was not, and we soon struck up a conversation with her and her traveling companion. The two women were indeed British, and had never traveled on Amtrak before. I was happy to educate them, and they seemed to appreciate the information. We ended up getting so cozy that we invited them to share our “piazza” with us in the parlor car, and we decided to have dinner together that night on the train. These two were the absolute highlight of our train to Denver. As the afternoon and then the evening wore on, we became more and more fascinated with these two middle-aged women. They introduced themselves as Wendy and Janet. Janet was the more outspoken of the two: when they mentioned that they had gone to a Cubs game (and we excitedly said that we had done the same, a few days earlier), Wendy mentioned that she played Cricket, but it was Janet who pointed out that Wendy had been a member of the team that won the Women’s Cricket World Cup for England in 1993. We were astonished at this, and later looked her up. Yep, there she was: Wendy Watson, cricketer. We had a lot of fun trying to explain the game of Baseball to them–neither of them knew the rules, and had tried to figure it out just by watching the game–and then they tried to explain Cricket to us. I’m guessing that our explanation of Baseball was about as effective as their explanation of Cricket: I sort-of get the basics, but after a while in the explanation I just got lost. I really need someone like this to explain the game to me while I’m actually watching a game, I think. We were somewhat surprised to learn that while Wendy was training and playing, she also had a full-time job working for British Rail. Apparently, their players–the women’s cricketers, at least–don’t make a profession out of it. She told us that she had been “made redundant” (that is, she was laid off) from British Rail just six months short of twenty years, at which point she would have received full retirement and benefits. And here I only thought that kind of thing went on in this country… Wendy currently works in a shop selling Cricket supplies. Janet, her traveling partner, was almost as interesting. She had worked for many years for DeBeer’s (the diamond folks) in London, traveling frequently to South Africa. One day she realized that she wasn’t happy in her job, and so she up and quit. She decided to do something that would get her outside, and so she became…a postal carrier. Yep, she walks from door-to-door, delivering the mail. Her friends thought she was nuts, giving up a good executive job to don the uniform of the British postal worker, but she absolutely loves it. We talked about the future of the British postal system; I had heard that it was to be privatized, and she confirmed that indeed that is the case. She isn’t sure what will happen to her job, but she’s just trying not to think about it. We got off the Zephyr in Denver, while Wendy and Janet continued on to San Francisco, where they were going to spend a couple of days sightseeing. We were disappointed that our schedules didn’t overlap; they had tickets to fly out of San Francisco International on the day we were due to finally return home. But we suggested a couple of things that they might like to do, so hopefully they had a good time. As for us, we were being picked up at the Denver train station by my brother David and his wife Brigid, and we were set to enjoy a couple of days seeing their part of Colorado. Stay tuned for how that went! This entry was posted in An Amtrak Grand Tour on May 20, 2013 by Greg Wilson.